Joyous in my new role as a first time grandmother, I had so much fun creating wonderfully simple... but soft and beautiful pieces for a modern baby's layette. "What exactly is a layette?" you might ask. a set of clothing, linens, and sometimes toiletries for a newborn child. Today's modern baby layette is a blend of both old and new. Modern babies still use receiving blankets and swaddlers, burp cloths and often even bibs. 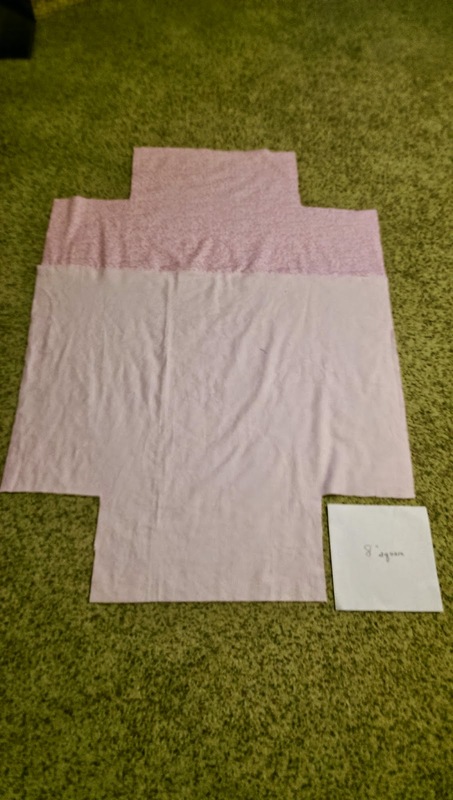 Many prefer homemade double layered flannel rather than the cheaper single flannel receiving blankets sold in stores. Or, they might even prefer the very thin gauze ones that are so popular now, and yes..you can make those yourself, as well! 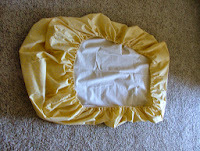 And while newborns may use disposable diapers for a week or two during the family adjustment period, a large number of today's mothers and fathers prefer cloth diapers in the new styles with outer covers made of PUL (a new waterproof laminate) or even wool fabrics covers, with inner gauze or flannel pads...or folded diaper like liners, as I made. Known as all in ones or all in twos, they no longer require the use of clips or safety pins but feature velcro or snap closures, often adjustable to a multitude of changing sizes. There are always the standard sleepers, sleepsacks, t-shirts, or onesies (once the little navel has healed) and lots of other cute things. But it's the basics that one needs first, since newborns are often dressed and wrapped very simply in the first few weeks. Crib and co-sleeper sheets...the list can be as simple or as complicated as you have the time and money to create. 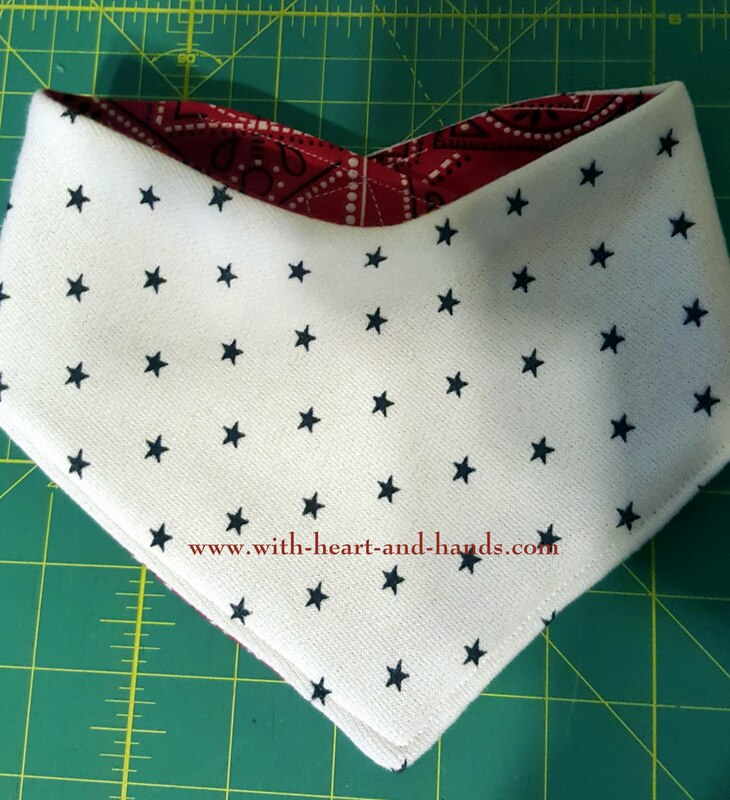 With my first grandbaby on the way, I spent those last few months creating hundreds of simple items that gave me an incredible amount of joy to make myself and to give to her mother and father, at the baby shower as creative, home made, (think American made!) in a clean sewing shop without pet hair or cigarette smoke or other issues that may occur in unknown homes or sweat shops. Using the simplest of cottons, flannels, organic or other natural fibers, and armed with coupons galore in repetitive shopping experiences, I was able to make dozens and dozens of gifts for either my granddaughter, or for the other newborns that we wanted to bless with homemade gifts. For now, I chose to purchase some quick little starter outfits...sleepers, onesies etc... but knowing that I once sewed all of my own three children's clothing, I know once I get going that I will have great fun continuing to sew and create many more items in the future! (and yes, I ended up buying a few more ;-) It's my first grand baby, I couldn't help myself! 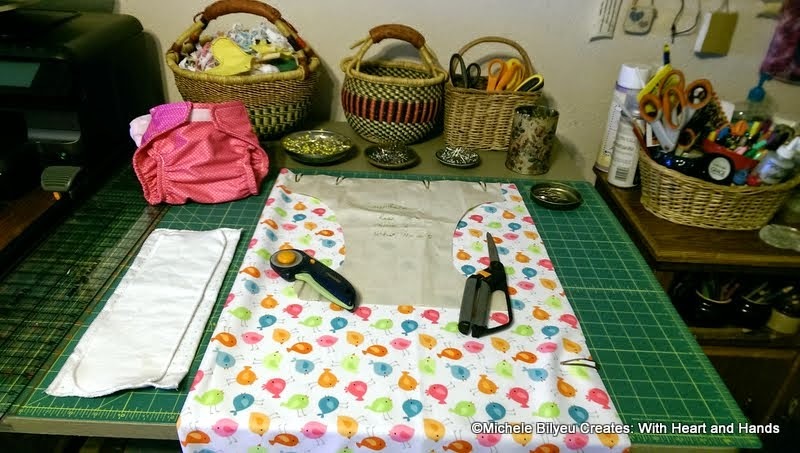 Sewing a Modern Baby Layette: What do you really need? And because creating artful quilts is important to me, another one to coordinate with the art prints the young parents specially purchased as the decor for the baby's room. 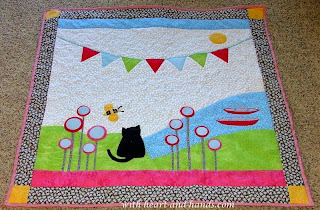 It features the family cat, our love of mountains, water, canoeing, and gardening and then of course, my prayer flags which I have loved making since the 70s. 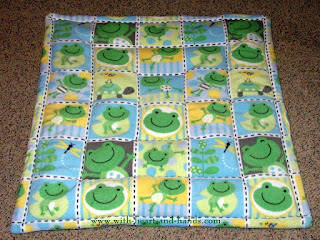 And of course: Other fun blankets and softies for baby! Super soft layers of flannel, tied with crochet cotton. 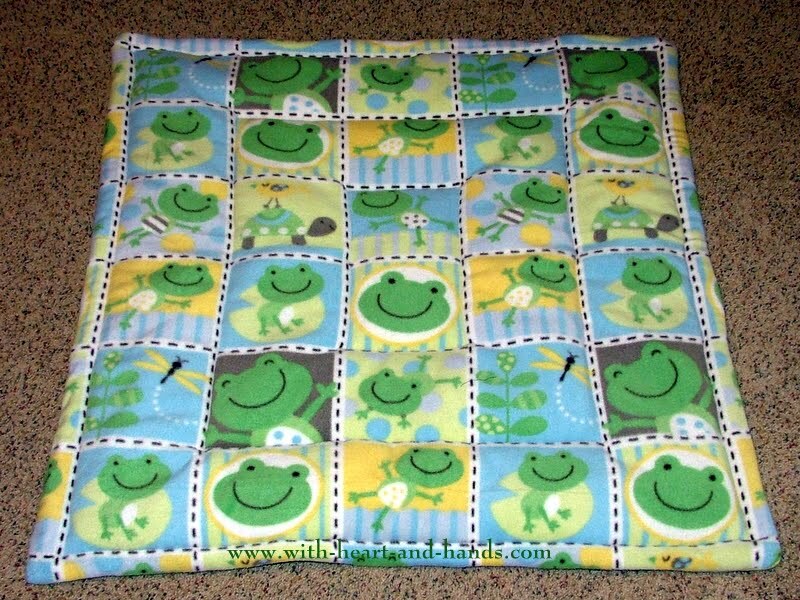 Great for swaddling baby up in a carseat or stroller. Soft and flexible and so sweet! 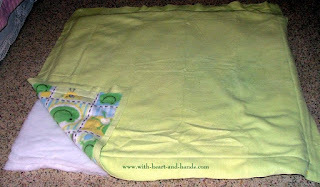 Receiving or Swaddling Blankets: I like to make 5 or 6 in lots of colors. They can be "36 squares. 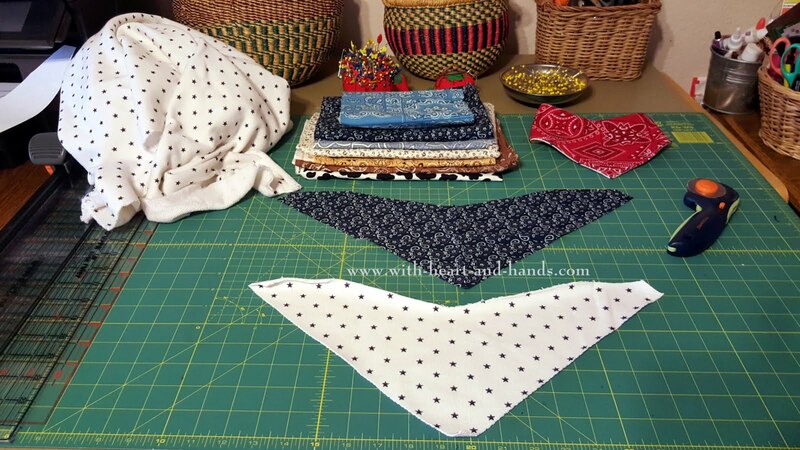 (use the leftover piece of a 45" piece of fabric to make matching burp cloths.) Sew wrong sides together. leaving an opening to turn. Turn and top stitch all around. 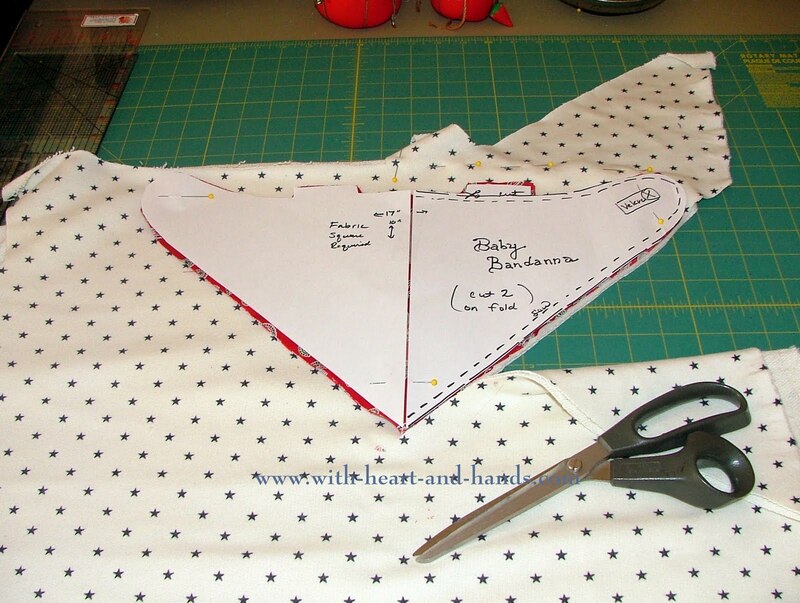 Round the corners as you cut them out using a bowl as a template. These can be a 22" to 30" square of double sided fleece. I love to add tags of ribbon on the edges. These are so much fun and so very easy to make. 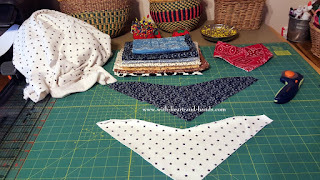 Using a yard of 60" wide fleece (for double sided blanket), or some orphan blocks, strips and strings to make a 30" to 36" blanket or quilt top and then just adding some 'tags' otherwise known as folded over pieces of ribbon, or rickrack, or pieces of trim. I used lots of bright colors and looped them with added length inside of the seam. 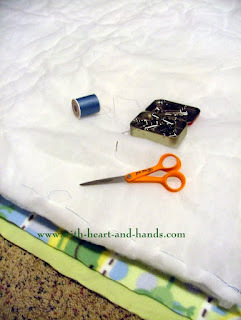 Then, you just sew on of your little bits and pieces down ..first for secure stitching and then with the back on, right sides together and making sure your tags are facing inside of the quilt so as to stick outside of it when you turn it right side out again! 2. Sew right sides together but leaving a small opening to turn later. 4. Hand stitching that opening so it is closed. And there it is!!! 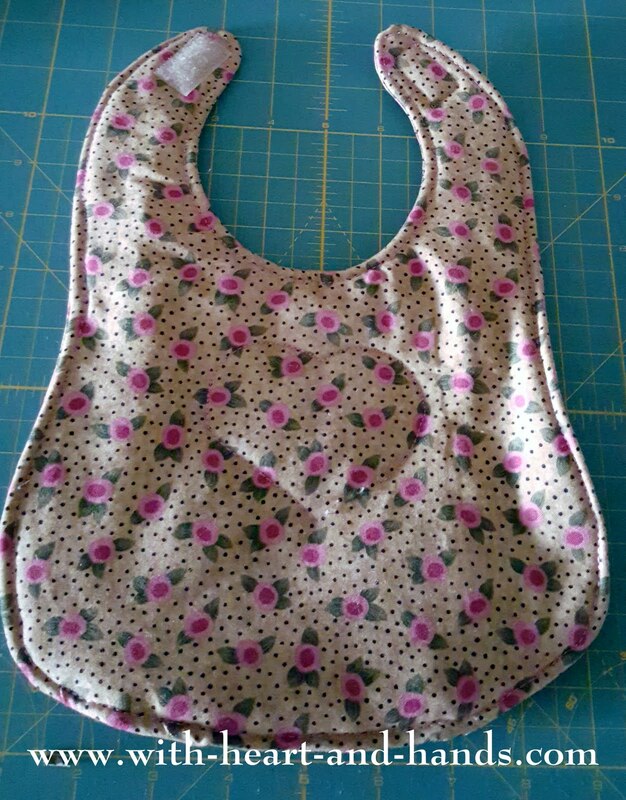 A simple baby bib made from any pattern or make you own. 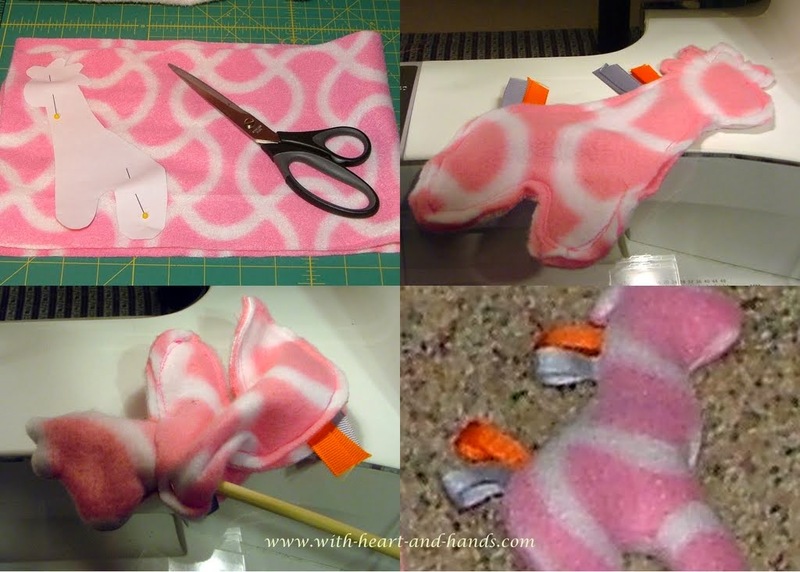 I just randomly free scissor cut from felt which stick nicely to a leftover bit of fleece. 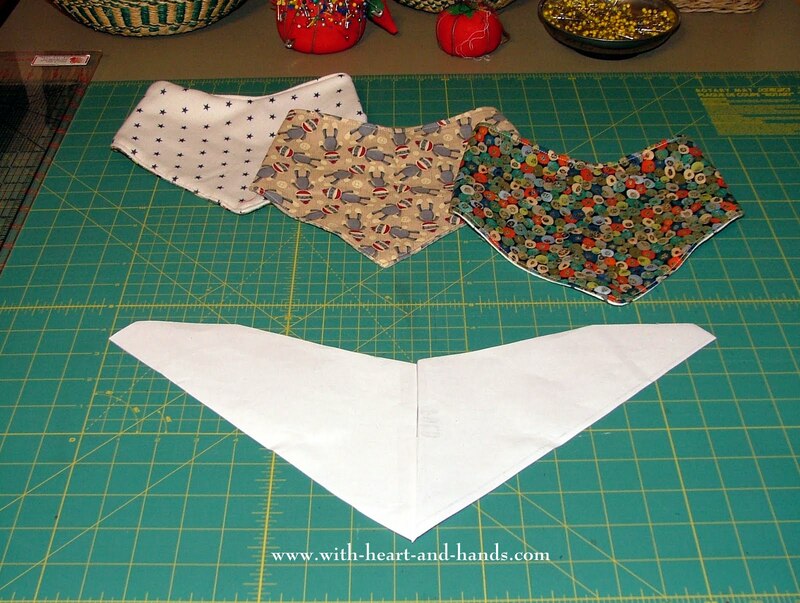 They will also stick onto the little heart (use flannel of fleece for the heart. It becomes a monthly photo opportunity for my little granddaughter as she grows month by month. And then of course, lots of basics!!! 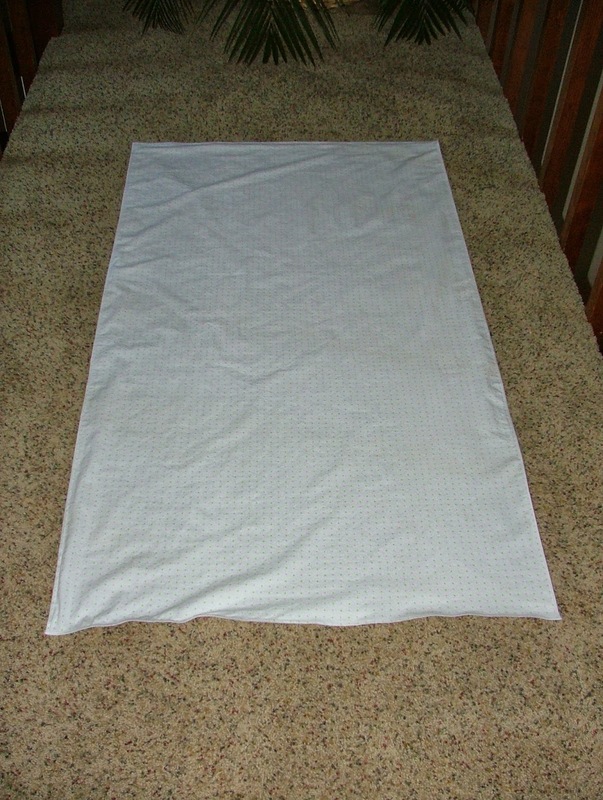 I used a simple rectangle of PUL waterproof fabric that was the same size as the top of the crib mattress. White is nice as it won't show through light colored sheets. Easy to make and wonderful to have even with a waterproof mattress it keeps it further keeps it nice and clean! I made three in different colors to match the variety of colors in my baby quilt and the baby nursery. Many modern parents prefer not seeing colors as 'boy' or 'girl' colors as was seen in the past. In the right place in the right amount, any color is beautiful and works great! The one I made is white with a tiny floral print in all of the colors you see in this post. It fills in the spaces of the lower rails to the bottom rail but is modern and minimal. Here's the one I made just being cut out to the size of the new mattress. 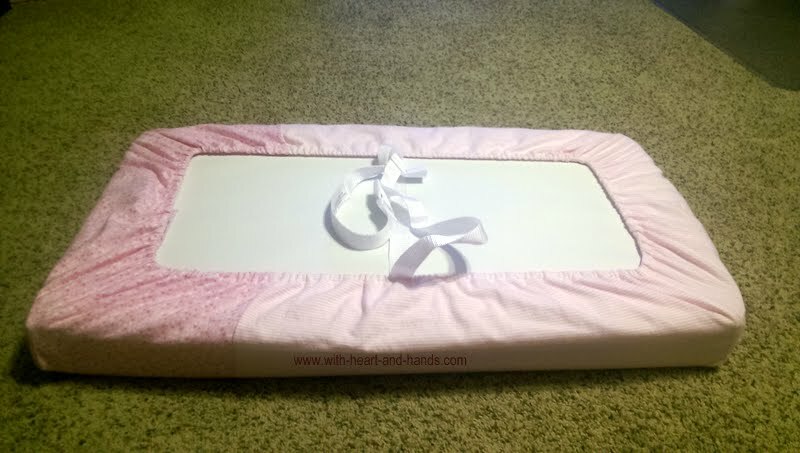 They tend to be slightly larger than older crib mattresses..so measure yours! 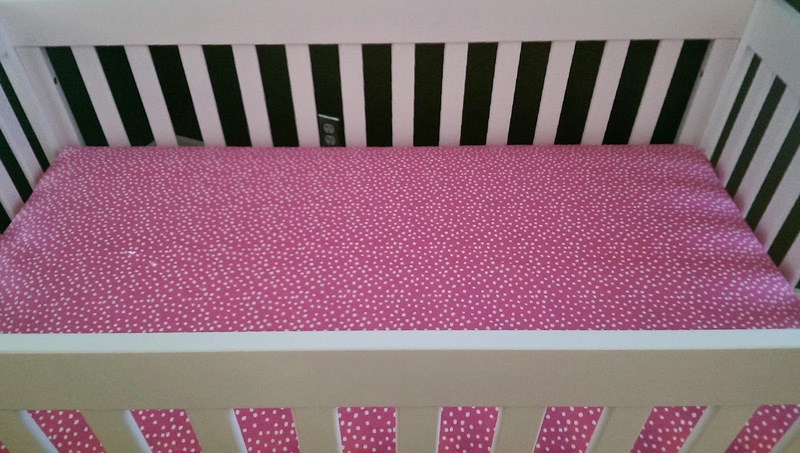 A crib skirt goes under the mattress on top of platform in the crib. It added just enough to hide the metal rail that peek out beneath. 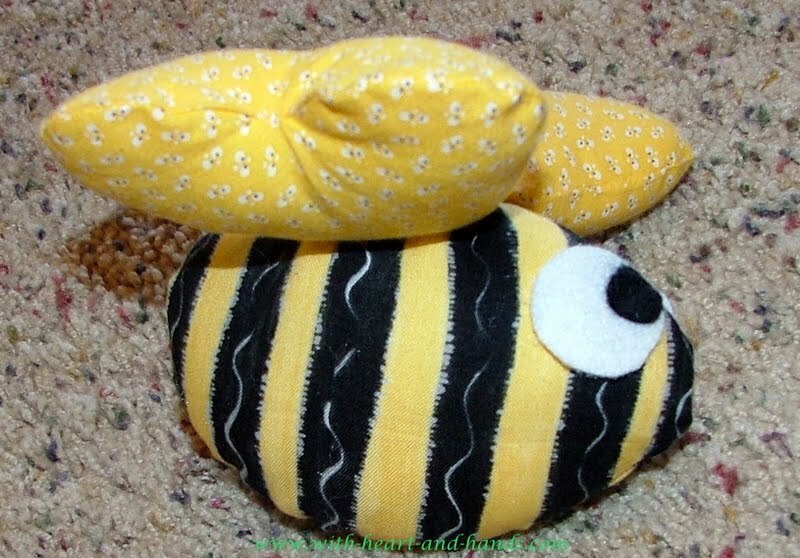 I made a bee mobile out of different sizes of bumblebees and circles for our own little 'Baby B'. 3D fabric circles and ovals are all the rage now but I wanted ones the baby could actually see. Strung on invisible fishing line from a wonderful Manzania branch.....way cute. I have lots of other colors of circles, as well..pinks, yellows etc. 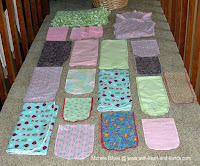 to change it up for fun..and to match all 3 sets of crib sheets ;-) See the mobile at end of blog post. 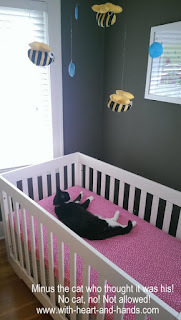 I know that every time I visit and walk by her nursery, I want to laugh out loud at how cute they are..and babies love black, white and yellow, and big eyes, of course! Mine are extra large and very comical on purpose and even adults laugh as they walk by! I made mine out of all of the leftover pieces of receiving blanket flannel. 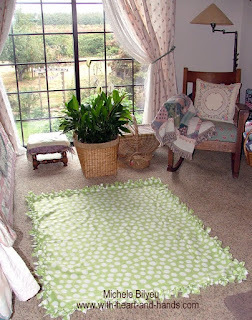 So easy and cute, and they matched my larger blankets as shown above! 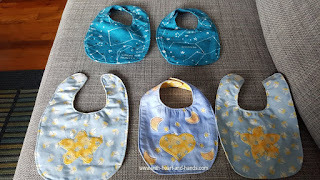 Bibs: 3 to see if they are used, up to 12 if they do use them! This was my starter set. Two to match receiving blankets and the newborn comforter, and one cute little french print because our little Baby B. ends up being almost as French as I am with french from both sides of our family. My French mother, who would now be a 'great grandmother' would have loved all of this so very much. I only wish she were here to welcome our little one, too! From tiny newborn sized, to infant, to toddler ...they are wonderfully convenient for 'saving' clothing from having to be changed as freqently from all of those spit and burp ups! 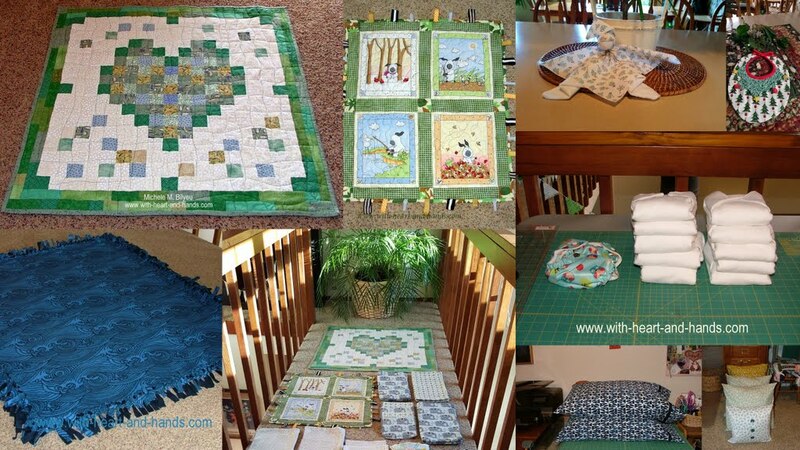 I love making blankets, quilts, cloth diapers, burp pads and bibs but mostly now, we're at the big ..cute ones..stage. 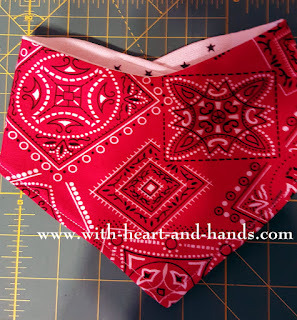 So, I discovered baby bandanna bibs and have been having so much fun making these tiny little bits of precious fun! And I've been sewing bits and pieces of fun. 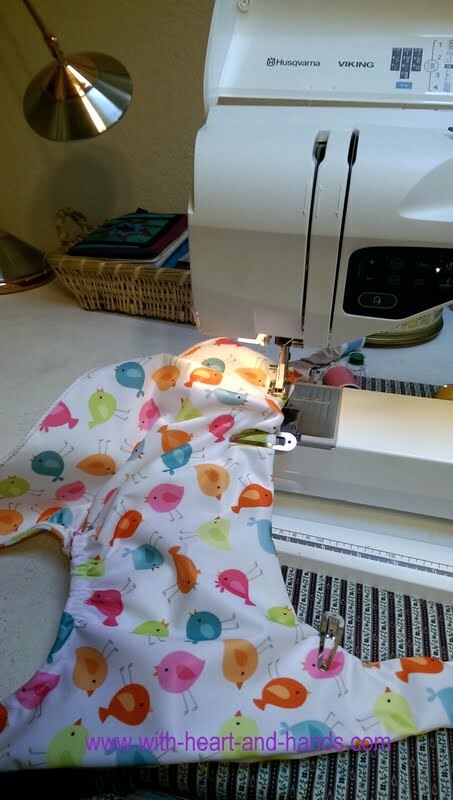 With a year and a half of being a new grandma under my sewing machine needle, I've sewn ..believe it or not...somewhere over 300 baby things. I did mention crazy right? All caps on the crazy. But its the most fun I know how to have..making little things for little precious people. And not just my own, anyone I can! Things you can do in 15 minutes to an hour and the sense of accomplishment from that is pure bliss. 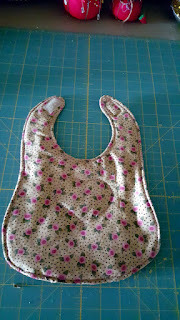 So, not yet shared, about a dozen new baby bibs. From ones that match the high chairs cushions for my granddaughter to sit in..oh, yes..made two cushions for our almost an antique wooden high chair from my children's era.....to baby bandannas for my wee 6 month old grandson. You don't really even need patterns for these little things. You just make your own, but here's hints and photo tips on how I do it! Oh, yes! The high chair bib. I added a little heart for my little sweetheart grandbaby girl. 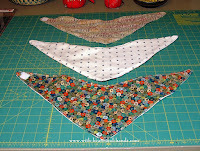 Lot of bandanna bibs..three different sizes as I went along with ever lengthening velcro strips for sizing up or down as needed. The two taps at the top of my 'pattern' ignore those. Those are placement point for the line of design on the fabrics. they got cut off after stitching. 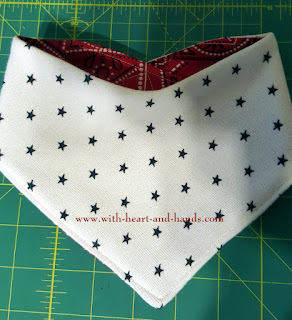 I used some hand me down very thick cotton knit for the backing on most of them..see the cute little stars. Absorbantly perfect in every way. Front of the bandanna bib. View from the back with the velcro on the strip across. Place the hook..rough..velcro on the inside so it doesn't scratch while putting bib on baby. Flannel alphabet..so sweet. Cotton print on the other side of this one. 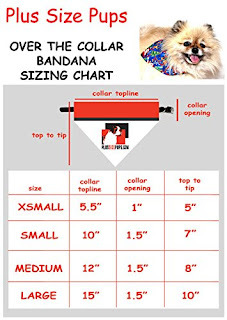 Thanks to Plus Size Pups for this great sizing chart for dogs! I measured the back and the seat...where the photos are right now..still looking but basically I place pieces of newspaper up against it and simply mark lines for the shape with a magic marker! Leaving extra for the flat batting to keep it soft and sew seams as you'd expect attaching tie on however you wish. After I find the photos I'll add them in. But I made a back cushion and a seat one. Very cute when done. These were from some leftover terry cloth. I whipped them up in no time to keep at my house for those unforeseen grandma and baby emergencies! Today's parent may seek to saves our natural resources by not using disposable diapers or wipes unless they absolutely have to. It's the best feeling to use homemade..over and over again! These are made from all of those leftover border strips of flannel we all end up with. 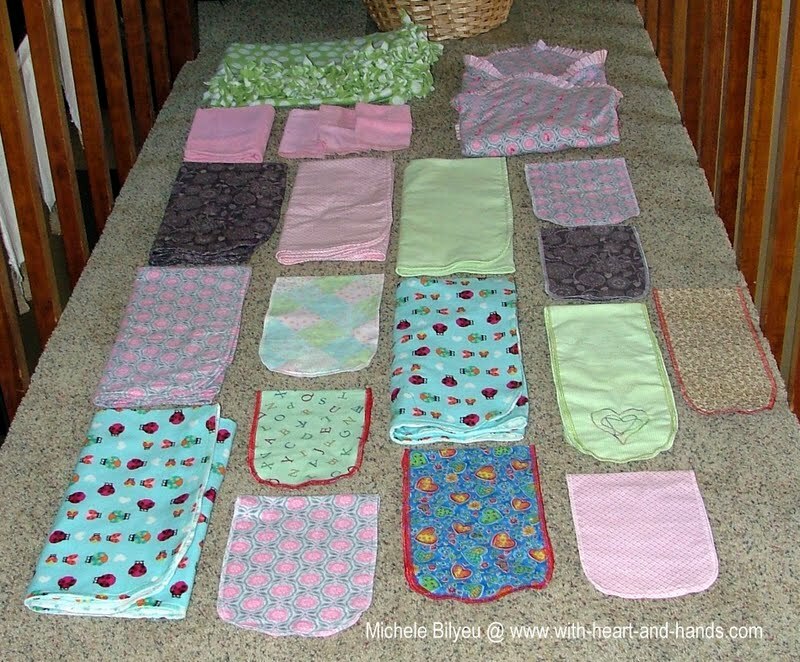 Just toss them in the wash with the cloth diaper liners after baby changes! 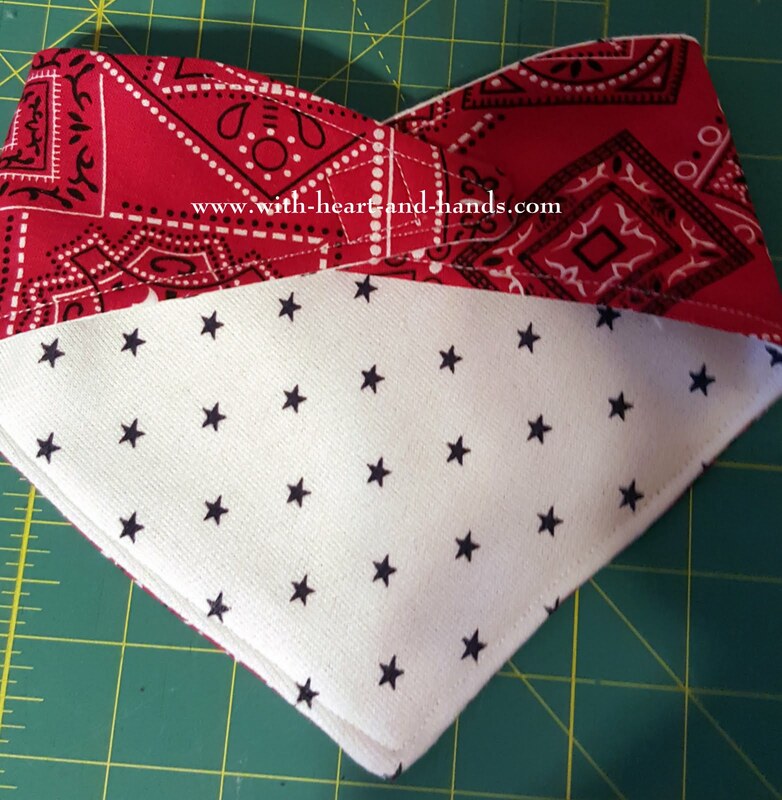 Make 6-8" squares of flannel serged into wipes. You could also seam them, turn right side out and topstitch edge for fancier gift version. Flannel over PUL fabric, shown open but folded over, in soft white print shown above. Add a long velcro closure clear across, edge to edge. Almost completely waterproof! These were a huge hit!!! Cloth diaper stores now sell them...for a lot. 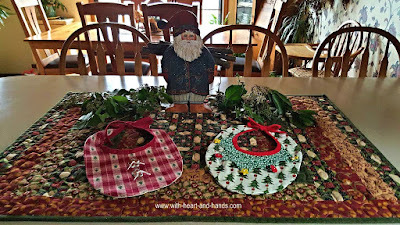 Save those flannel or terry cloth scraps and just make them as extra gifts or for you own use. I have many of them for various uses in my home. They're wonderful fun! And the little wet bag was almost as easy to create, as well! I made three sets.. These were soft and baby friendly, washable sheet-like covers from cotton, flannel, and fleece. Here you see them, nested in the fleece one, along with some bibs, burp cloths, and misc. items delivered as a gift. The 'Summer' changing pad shown bottomside up, in white PUL above, is available from Target for under $20. It is waterproof and easy to design removable covers for. If you don't use the 'belt the baby in' straps, just tuck them under the elastic sides. They are hot glued on at the factory and would have to be cut off, otherwise. Save the straps! 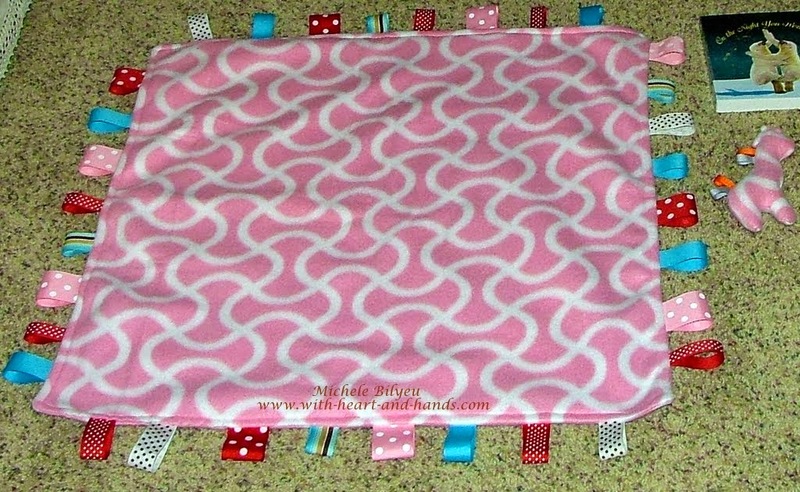 I also made a fleece changing pad sheet just for fun, and the new mom told me later that it was her favorite by far. Water resistant and super soft for baby. Now, they are my first choice and then other ones for fun! It takes 33" of flannel (after cutting a 36" piece before prewashing) plus width of fabric for the wrap under sides and casing. So, 33"x 44" each, unless you make duo toned ones! 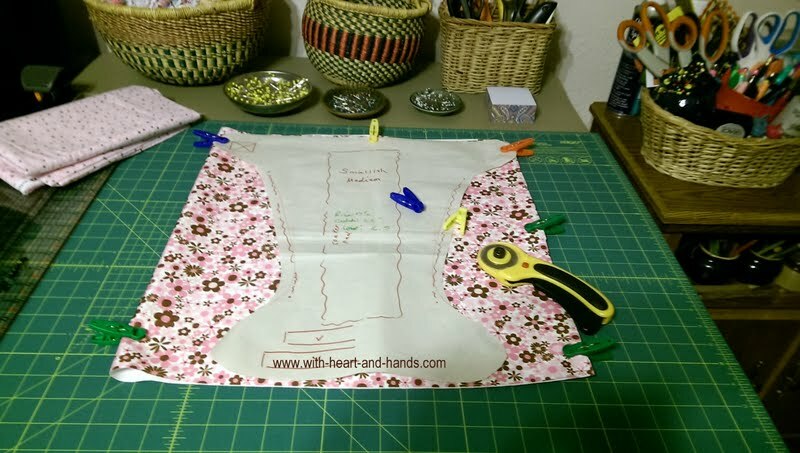 For those, I sewed on about 13" accent fabric first, you cut out the four corners as shown, sew them together underneath at the corner seam, and make a 1" or so casing for a piece of 45" elastic. Just like making a crib sheet, only a bit smaller! Out of the leftover Diaper Cover PUL fabric, shown at the left as I am cutting out a homemade diaper pattern. So easy to make pads! 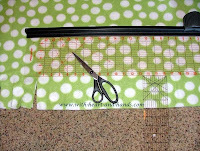 Just cut a piece about 22" square or larger from leftover diaper cover PUL fabric. I did double sides and serged the edges. It does catch the air a bit.You can also just use a remnant of fleece. 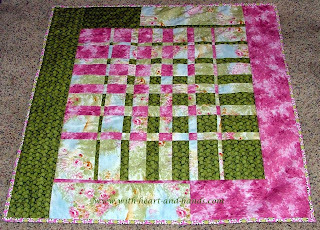 Sew or serge the edges all around the square. Mine was about 60"by 72" and was generous enough for mom or dad and baby. Used and reused and appreciated by both of them. 1.For a large 'family sized' fleece blanket, buy 2 yards for both front and back..the same fabric, or co-ordinating ones. 2. 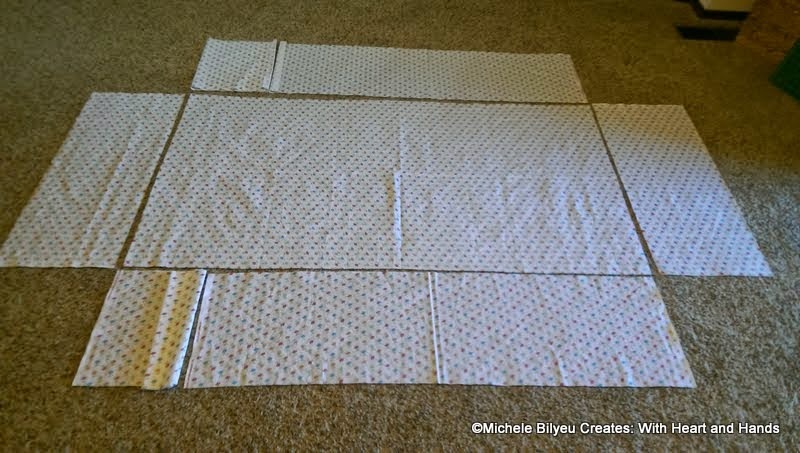 Lay wrong sides together, so pretty fabric shows both top and bottom to you, and using a ruler, cut out a 5"-7" square at each corner. Using a 5" cutout creates a larger blanket as less fleece goes into tying it, but a 6" or 7" fringe depth creates a very elegant look. 3. Using your scissor fringe your fleece blanket by simply eyeing a 1" width cut and your selected 5"-7" depth. Be sure to ignore the most popular web engine search for this..theirs is far too shallow and that is why their blanket is all rounded at the corners and looks terrible! 4.Now, simply take one strip of the top fringe and one strip of its matching bottom fringe and tie a knot with them, and then tie another or double knot! 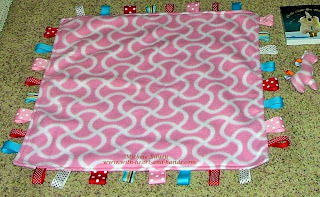 Easy, quick, and a lovely blanket! 1. 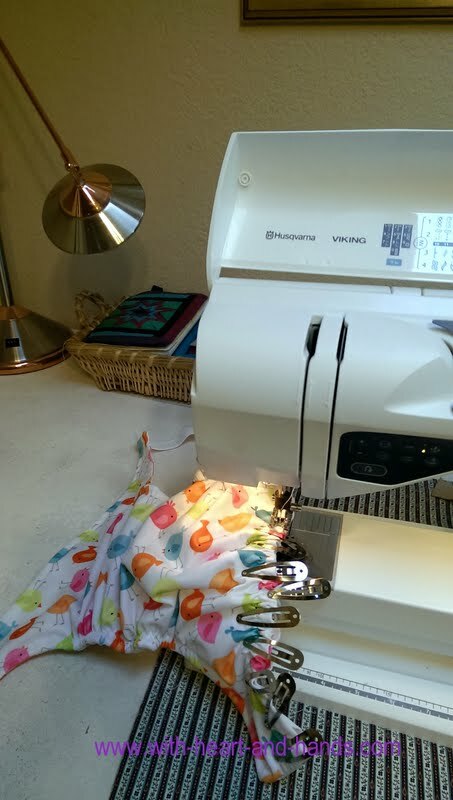 You will need 3/4 yard or 27" of fleece for the front of the pillow and 27" of fleece for the back of the pillow, a 16" pillow form or even just some thick batting folded into the correct size to create your own pillow form insert. 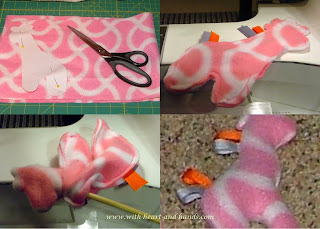 2.Lay fleece wrong sides together (right sides up!) and cut a 5" square from each corner. 3. Cut fringe 1" apart and 5" deep around pillow shape eyeing the start and finish to create nice fringe with those cut out corners! 4. Knot fringe layers, once then again for a double knot! And a really puffy play pad. It goes under one of those lay down baby activity play centers. The oens that aren't quite soft or padded enough. A couple of pieces of 36" x 36" (finished) fleece and a super soft piece of layered multiple times batting inside. Now, I used upholstery batting...very, very thick plus two layers of thin polyester batting on each side. I didn't want hugely thick seams so I first sewed the fleece 'blanket' together right sides together, leaving an opening to turn right side out. Then I cut the batt just the right sides, rolled it up, fit it into the opening, flattened it down nicely by hand inside. Then I sewed if down , catching it on the outside. Think about it logically instead of following these directions. Worked perfectly and easily with no bulky seams just the two fleece edges inside. 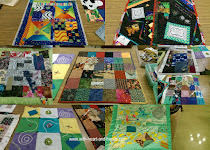 Just quilt it down here and there ..I did outlines of a few blocks..and boy did it work well! So, there you have it. 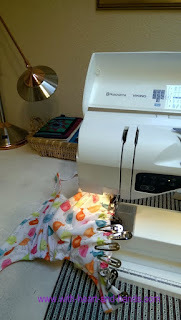 Snippets and Threadtales from the sewing room amidst the wild and crazy goings on of my life! Wonderful to keep one near baby's rocking chair or glider. Keep some essentials in here...burping pads, receiving blankets, an extra outfit. Wonderful to grab when just a diaper bag isn't enough for everything you need to bring along on a car trip or to keep your own book in when reading to yourself or baby! 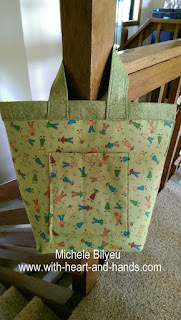 I put lots of pockets on the inside and a big one on each side of the bag, itself! 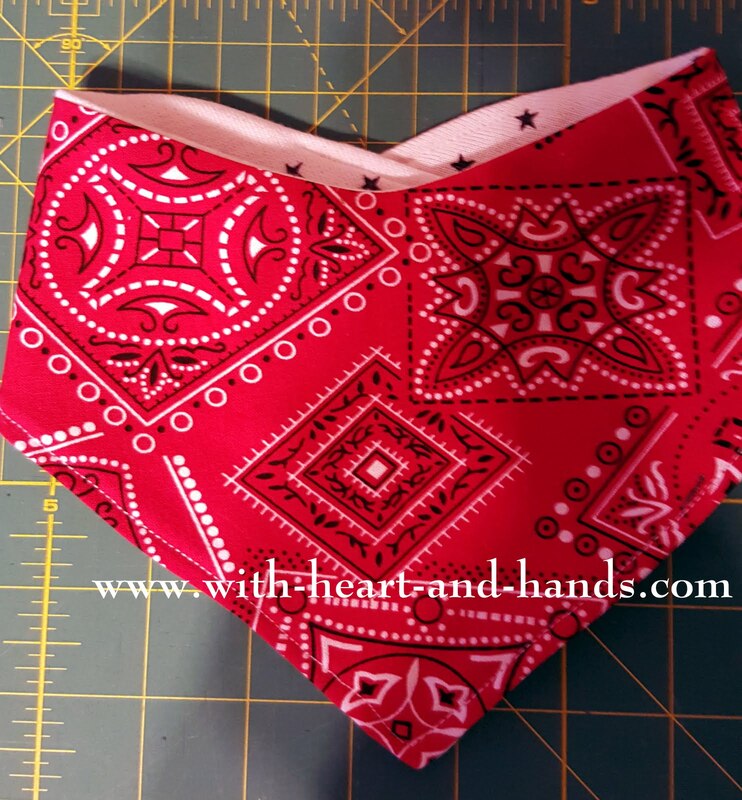 Today's cloth diapers are now actually folded inserts made of multiple layers of flannel or gauze..
You can use a diaper shaped piece of fabric (coming soon) or newborn inserts of squares or rectangle shapes. 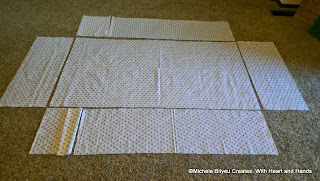 Here, I sewed two sets of flannel squares that were folded into thirds creating 6 layers of padding. They can be folded into different configurations for changing changes as baby grows. The multiple layers help with aeration during washing and drying unlike the oval pads some sewists are using that lay flat and stay damp. Mine are PULdiaper covers +flannel liners diapers. This combo is known as 'all in ones' or 'all in twos' diapers/cover combos. PUL is available in the Babyville section of Joann Fabrics or online in many other sites. Patterns are available online but I wasn't completely happy with a single one of them, so winged my own. You can see the gist of its shaping etc. Just pick the free or purchased pattern of your own preference! Don't use pins for holding as you sew. 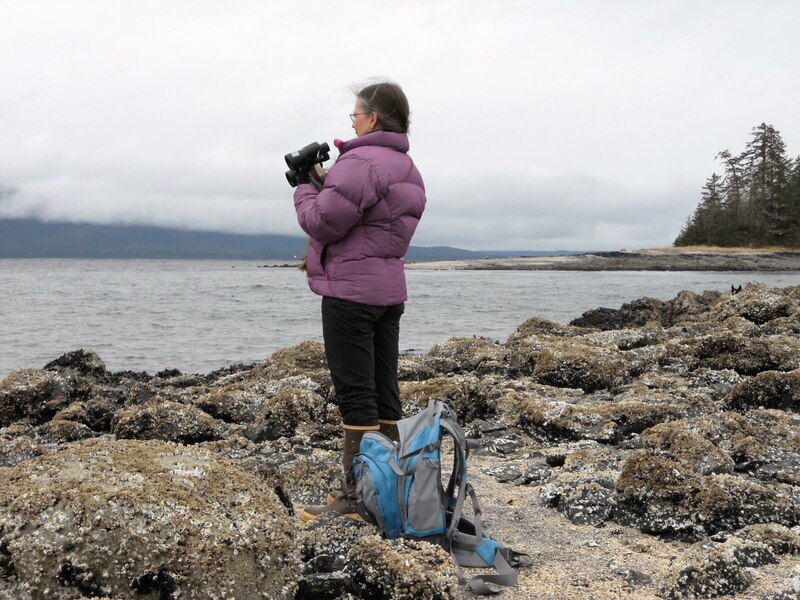 They leave holes in the waterproof fabric, making them no longer waterproof! Instead use hair clipees! Hold securely and work perfectly! 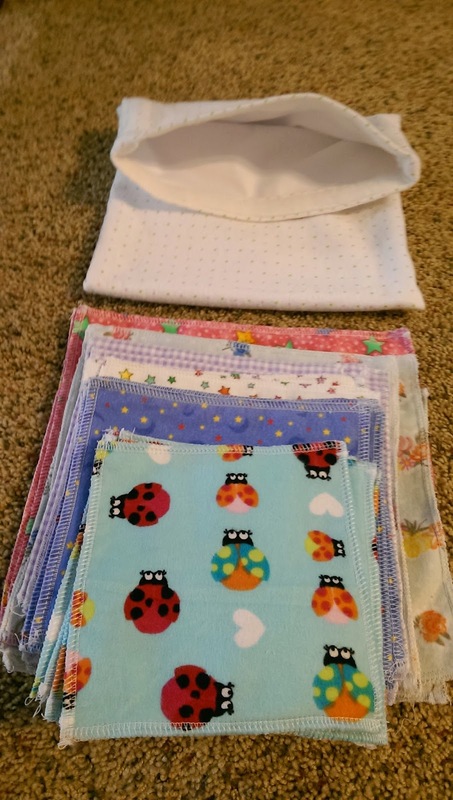 My diaper covers were double sided PUL and can be wiped off and reused for multiple diaper changes, Gently washed and dried when needed. The inserts or cloth diapers, themselves, are washed over and over, hence the inside out seaming and not just serged edges. And then of course, all of the fun outfits and accessories: sleepers, sleep sacks, two piece sets with booties or socks, mittens, that list goes on and on! 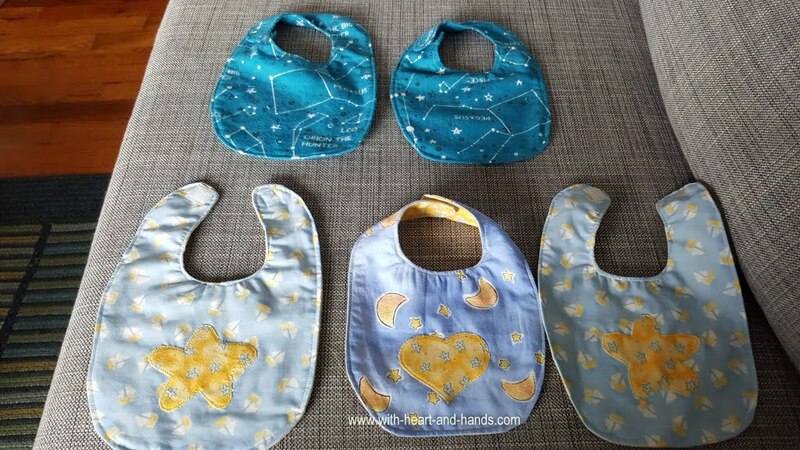 If you look at free patterns online, be aware that you want ones that keep baby dry but soak up waste products for wash-ability. I felt that my combo would work the best. 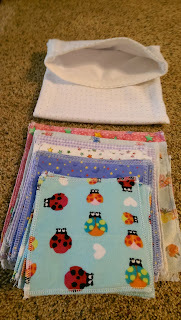 And because of a personal request to do so, I also made reusable cloth diaper wipes!!! Incredibly easy, I just serged 4 layers of flannel together and added a scrap of PUL diaper cover fabric turned into a waterproof diaper wipe holding bag! If money is a major consideration, really and truly a newborn only needs enough diapers, blankets, or clothing to get buy for a day or two, then just wash and reuse! Most parents save their sanity with a few weeks of disposables even when dedicated cloth diaper users as I was with all three of my children and as my own children are, today with theirs. 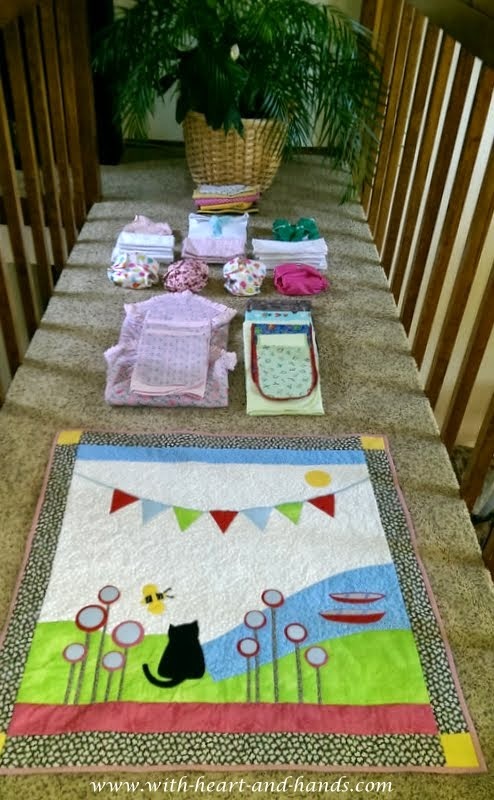 Results of all of this home made layette sewing and quilting: I had so much fun, I did it again, for our family and my grandchildren and to donate to others. 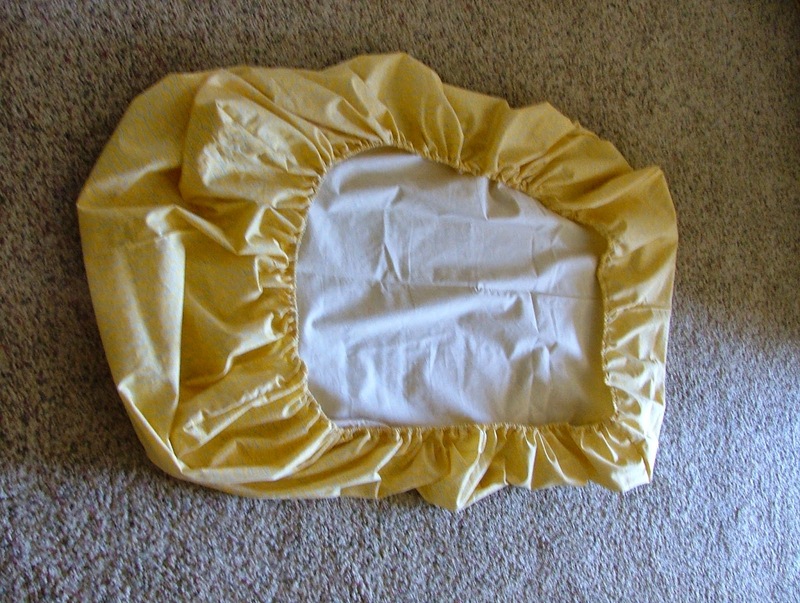 Below: the simplest of cloth diapers as requested by nurses and doctors traveling to foreign countries. These and many more were sent to Guatemala. Hospitals there, often resort to sending babies home in newspapers! How incredibly sad is that? Makes us all rethink our American obssession with disposable 'paper' diapers, doesn't it? Yes, I made the mobile, too! I had so much fun making all of this plus lots and lots more. Make a couple of items or make a lot. It's all fun and all appreciated and used! Oh wait a minute!!! No cat no! Out, out! That's not Your new bed! Gosh, laundry already!!!! And this was before my first grand baby had even arrived!! Oh Michele what a wonderful gift and such a blessing for your little greanchild. Incredible! Wow! 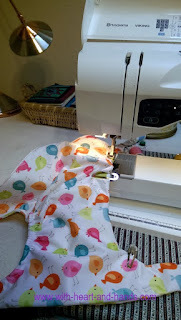 you could write a book on sewing for the modern baby! 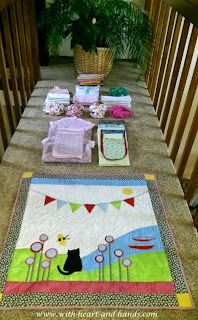 I love all the goodies you made for the new grandchild, Michele. Very thoughtful gifts that will be used often, I am sure. Don't you just love making things for her? I am sure you get as much pleasure from making them as the parents do in receiving them. wow! 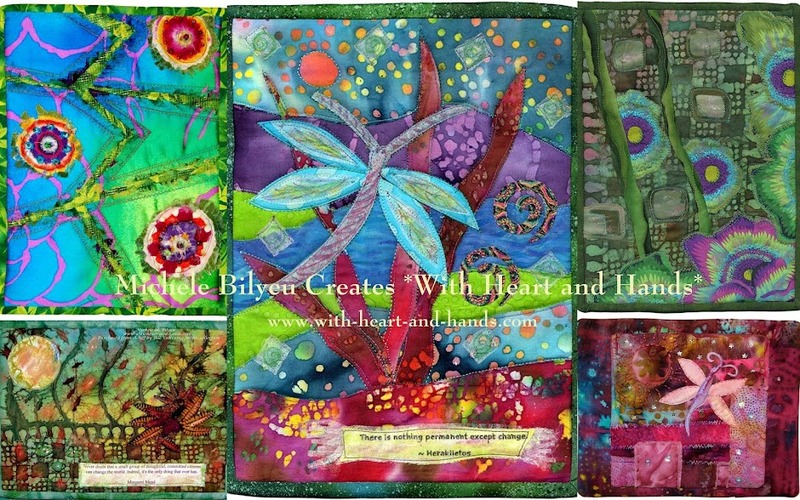 what a wonderful marathon of sewing you did with the most gorgeous and useful results! This baby girl will always be wrapped in love no matter what! You are so generous and so talented, thanks for sharing all the goodness. This is my idea of fun too..so much fun. I'm a new grandmother too. It is so wonderful. I told my husband we need to add a category to our finances "spoiling grandchildren". Just made her a quilted Christmas stocking. Hope to sew a set of washable diapers this winter, now that I've seen yours I feel more inspired. 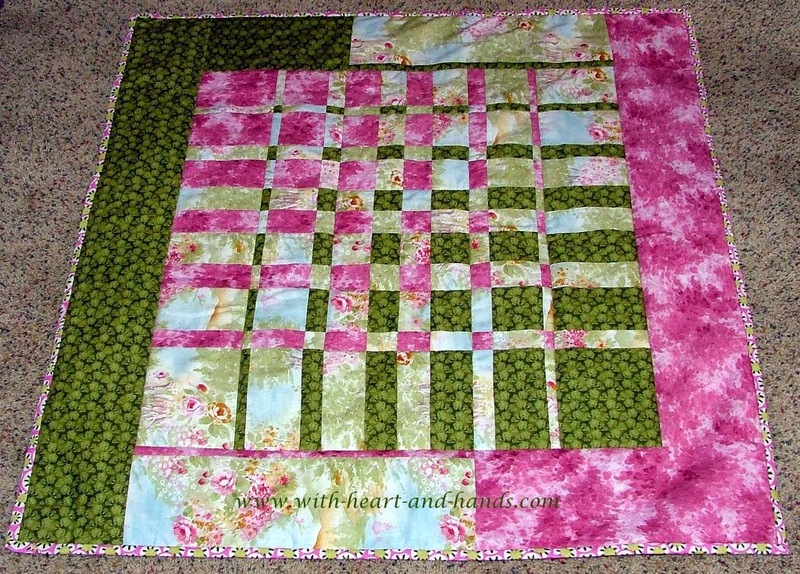 This link is to her first quilt, right now it hangs over her crib, when she's bigger it will fit her bed. I love how you are having so much fun making these wonderful things for your newest family member :) And such delightful things to make for your grandbaby :) Beautiful.